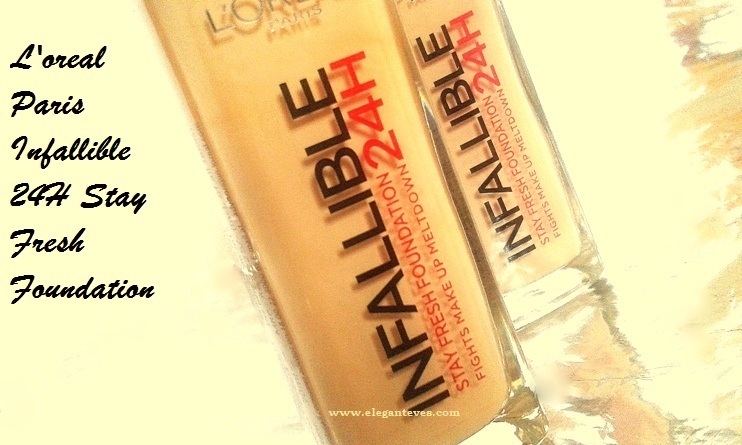 Packaging: The packaging of this foundation is pretty functional- a see-through glass bottle with a maroon colored pump dispenser. The pump is of good quality and dispenses just the right amount every time-neither too less, nor too much. The cap shuts well and has the shade name and number label stuck on its top. 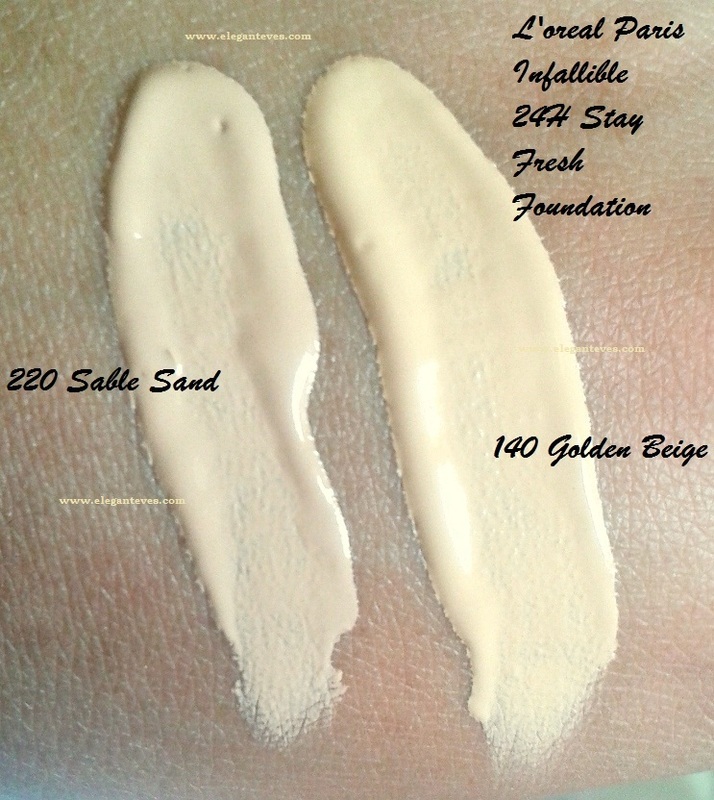 My take: I received two shades from this range- 220 Sable Sand and 140 Golden Beige. These two shades are very similar to each other except for the fact that 140 Golden Beige is a tad more yellow than the other. It was impossible for me to capture the color difference in camera when they are bottled. 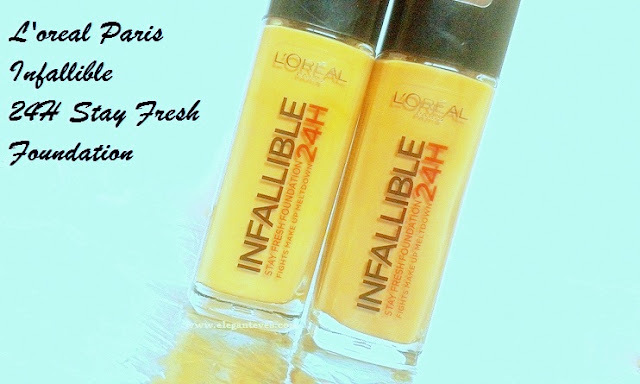 Texture-wise L’oreal Paris Infallible 24H Stay Fresh Foundation is comfortably liquid-y. 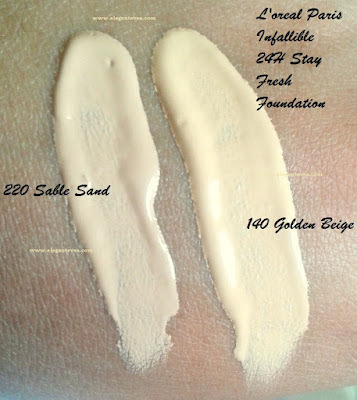 What I mean to say is, it is not too dense like those super matte foundations (like MAC Studiofix). It blends like a breeze. Just remember to take a tiny drop and work into your skin drop by drop. The first time I squeezed out the normal amount I thought that my face would need and it was wasted L A tiny drop covers a large area. 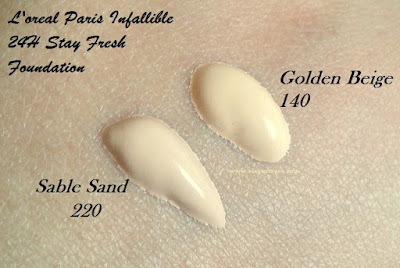 Since I never like full coverage foundations, I take the tiniest possible amount and work it into my moisturized skin. Even with that tiny amount, it is capable of covering minor imperfections on the face. 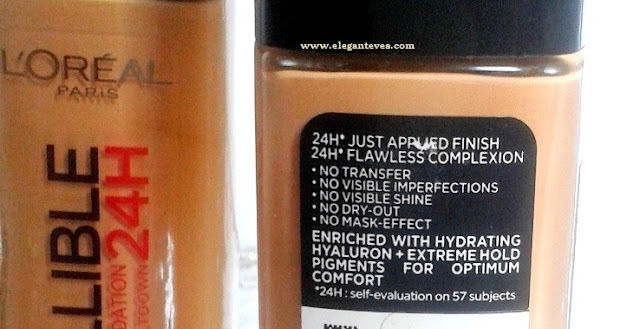 So needless to say, if you find your perfect shade match then this foundation will be heaven-sent for you for those heavy coverage requirements too owing to the fact that it is very buildable. 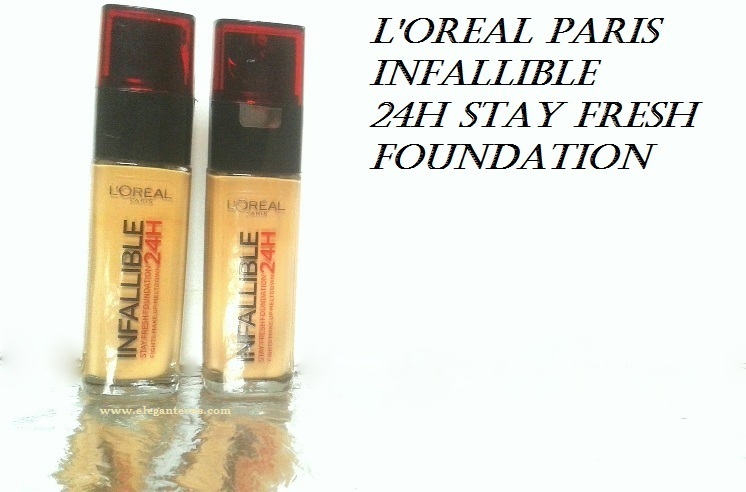 Also, after setting, the foundation does not make my face look flat and without color. 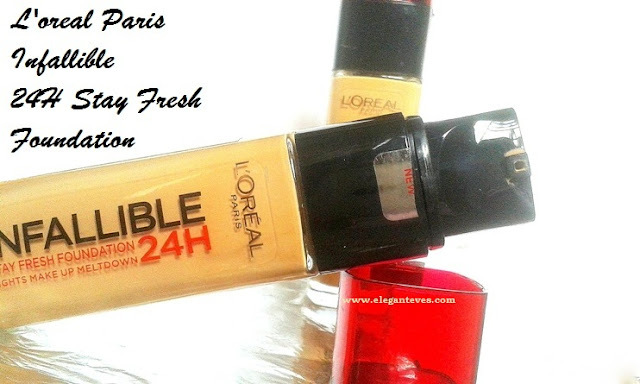 There is a subtle glow that we get from dewy foundations. 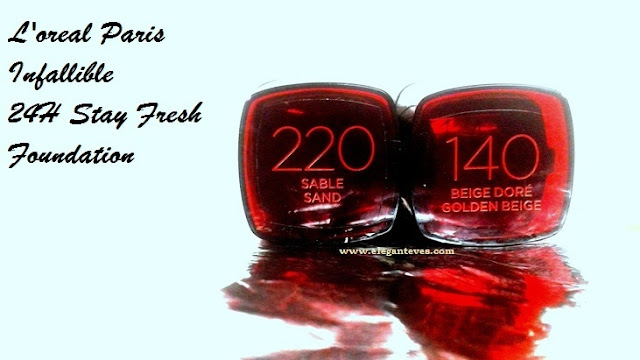 This pretty one sets to a semi matte finish- and your skin is not stripped off the natural moisture. I love how natural my skin looks or feels (no heavy plaster kind of feeling!) yay!! Staying power is pretty awesome too. It stayed without fading for the whole day on me! Oily-skinned beauties might need to powder their nose or T-zone after 6-7 hours, but for normal-dry skinned ladies, this one is the best bet! True to its claims, the foundation does not transfer much in normal weather conditions. 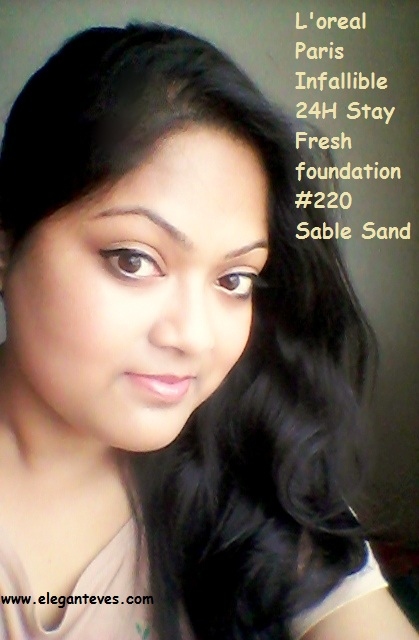 If you are staying in too humid regions, you might want to further set the foundation with a dab of powder.